Increasingly scarce Scottish Highland Infantry Officer's Broadsword, WW1 era. Probably the must sought after British sword by collectors, this is a solid Scottish Highland Infantry Officer's Broadsword made by Samuel Moses & Son Ltd of Mansell Street, E.C., London sometime between 1908 and 1917. Whoever the original owner was almost certainly experienced the killing fields in WW1. At 1.681 Kg in a leather field service scabbard, this is quite a hefty sword for the time to say the least, satisfyingly so. The 32 inch blade with thistle etching is firm in the hilt. The hilt aged but sound, the original crimson liner and remains of the tassel are a little tired, the fishskin grip is good and the ring bindings (twisted grip wire) in good order also. The leather field scabbard with correct ball chape has rusted steel fittings and a large kink towards the end but is sound and looks good display wise. 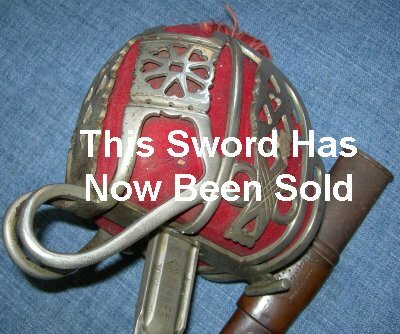 The swords are becoming increasingly expensive to source and this one represents a tremendously good investment and ownership opportunity. Further pictures available upon request. My item reference number is 516 (8).